Domapartment *** Cologne City offers serviced and modern furnished holiday flats and apartments for accommodation in urban neighbourhoods in the city center of Cologne and Aachen. 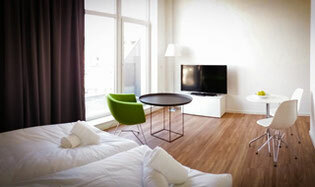 In Troisdorf-Spich nearby Cologne/Bonn Airport we operate several Business Apartments. Whether for short-term stays, business or leisure - We offer an attractive alternative to comparable suites of superior category hotels.